I mentioned in my Summer Essentials Video that there were a couple of “dupes” for the gorgeous NUXE Huile Prodigieuse. I hate the word “dupes” because it implies that the other versions are attempting to copy or “pass themselves off” as the original, but in the world of beauty, most things are replicated on a regular basis. There are only so many shades of red lipstick or taupe eyeshadow that can be in existence, so naturally there must be some repetition. Anyway, back to NUXE and their oil Prodigieuse. The version with gold glimmer costs £23.70 with free delivery (FeelUnique.com) and is worth every single penny. It lasts way longer than an entire summer, and that’s using it A LOT. It has a spray bottle, which makes it easy to apply, and you get 100ml. 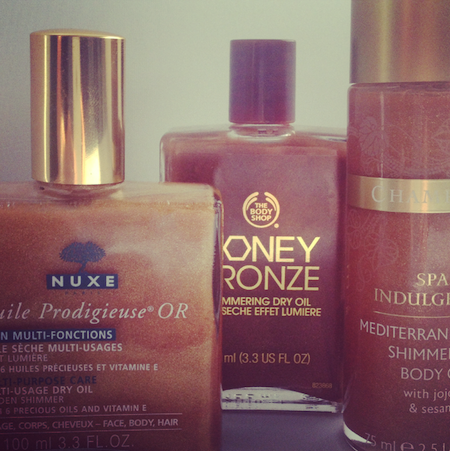 The Body Shop make a version of a shimmering oil, but the shimmer isn’t anywhere near as striking as in the NUXE oil. It’s £16 for 100ml (buy online at The Body Shop) and although it’s a decent oil, so long as the NARS NUXE (brain-fry) version exists I would always save up and spend the extra £8. Champneys, however, have done quite a lovely shimmering oil with Jojoba and Sesame. It’s lighter than the NUXE and doesn’t have the same heady, exotic fragrance, but the shimmer and effect is almost identical. It’s £10 from Boots.com, making it quite a great “budget” buy. You know how much it must pain me to do a “dupes” post – I’d rather just talk about the best version of something, whether it be cheaper or more expensive! – but I was quite surprised by how similar this one was to the Prodigieuse.